I am currently a student in the M.A. program New Media and Digital Culture. My B.A. program was towards Film studies, but during an internship and writing my thesis I noticed New Media always found its way into my field of study. Therefore, I chose to pursue the M.A. in New Media. My interest lies mainly with social media marketing and the concept of memory. Many frequent users of Instagram (including myself) at some point experienced the following scenario: a moment captured with the camera on your smartphone is significant enough to share on Instagram. It looks great in either landscape or portrait, but the next step entails uploading the picture to Instagram. This provides users with the ultimate challenge: which friend to cut out of the picture in order to make it fit the square format (Mangalindan). The initial thought behind this characteristic square picture was that “it looked beautiful, and it looked really nice in feed when they were mocking it up”, says Ashley Yuki in an interview with TechCrunch (Constine). However, this has not prevented users from wanting to share content in landscape or portrait format. Users often turn to external apps to modify their pictures, as developers at Instagram recognized that one in five pictures are not suitable for the square format (“Thinking Outside the Square”). Therefore, they have announced that the latest update for Instagram will allow users to share videos and photos in landscape or portrait format (“Thinking Outside the Square”). Whenever a user uploads a picture to Instagram, an icon will appear in the bottom left corner (see emphasis Figure 1), which lets users switch from square to either landscape or portrait format (“Thinking Outside the Square”). This new feature expresses a significant change for Instagram, as it used to distinguish itself from other photo-sharing platforms by staying true to the square format. The introduction of these new formats can enhance the creative freedom for users (Constine), as pictures can be shared the way they were originally captured instead of having to mess with the format. Users no longer need to seek assistance from external applications to force landscape or portrait into the square, or take time considering what to leave out of the picture. This might lead to a change in the way users post to Instagram, from postponed sharing to the more instant sharing of pictures and videos, as they require less thought and editing (Constine). Furthermore, users can now use the same picture across multiple social networking sites, such as Facebook. They no longer have to take different formats into account when posting a picture, making their content shareable all across their online social network (Constine). Yet, there seem to be two sides to the same coin, as Instagram announced roughly a week later that it will open up their services to all advertisers, instead of just a limited amount (“Instagram: Open to Businesses of All Sizes, Everywhere”). As an article on Reuters states, it is the biggest adjustment to the platform since it has been bought by Facebook in 2012 (Abutaleb). The short time-span between these two announcements calls into question the motives behind this change. It makes it appear as though one of the main reasons Instagram is significantly changing, is for it to attract more revenue through advertising. The revenue is expected to increase from nearly 600 million dollars to 2.8 billion dollars in 2017 (Abutaleb). Therefore, it seems that the feature users have been asking for will turn out to work against them, as it demonstrates that prosumer capitalism is becoming the norm in the current digitalized society and economy (Ritzer 415). Users on Instagram function as ‘prosumers’, since they are considered consumers by using the platform, while at the same time they act as producers by providing content (Ritzer 417). However, what users unknowingly produce most is data that is valuable to brands and companies (Arvidsson and Colleoni 137; Ritzer 427). The new formats will provide more and new possibilities, which will spark an increase in content-sharing on Instagram, keeping users from moving on to other photo-sharing platforms. Furthermore, the creative freedom these new formats provide might attract new users to the platform (Constine), while it will encourage current users to spend more time on the photo-sharing platform (Abutaleb). Users will not notice that this increase in usage lets Instagram exploit them, as the developers collect data without returning any reward and by sharing this data with advertisers, while making a bigger profit (Arvidsson and Colleoni 137; Ritzer 433). Furthermore, advertisers can use these same features to their own advantage. They can now exploit the same content throughout their entire social media campaign, as well as create new content since the new formats provide more space to work with (Szyszka). As Debra Aho Williamson states: “You want people to be able to see more of your ad. It’s something advertisers are definitely going to be interested in” (Abutaleb). For example, landscape makes it possible for videos to be released in widescreen on Instagram (see Figure 2), which makes the platform interesting for film studios (Szyszka). So, how long before users on Instagram notice that ‘be careful what you wish for’ turns out to be true? The developers of Instagram have disguised these new formats as a welcome adjustment to the platform, while it actually provides them with a tool to lure more advertisers and to further exploit users. It is up to the users to notice these underlying motives and instead seek ways to make prosumer capitalism work to their advantage. Abutaleb, Yasmeen. “Facebook’s Instagram adds new photo sizes to keep users, attract ads.” Reuters. 2015. The Information Society 28.3 (May 2012): 135–150. Techcrunch. 2015. 10 September 2015. “Instagram: Open to Businesses of All Sizes, Everywhere.” Instagram Blog. 2015. 10 September 2015. Mangalindan, JP. 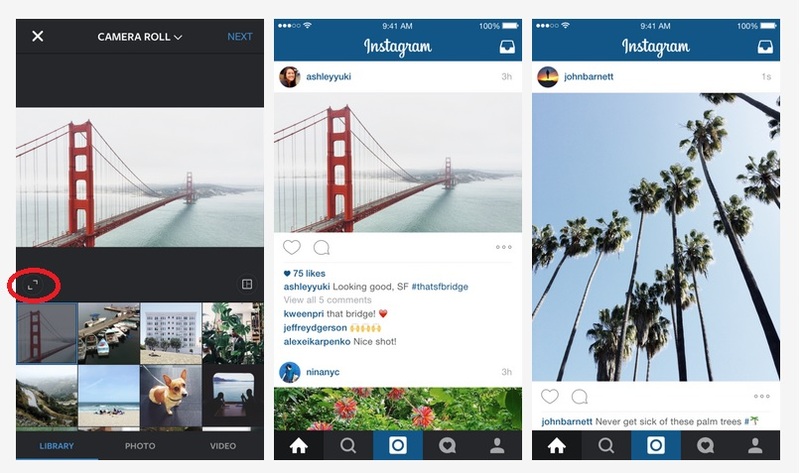 “Move over, squares: Instagram now supports landscape and portrait modes.” Mashable. 2015. 10 September 2015. <http://mashable.com/2015/08/27/instagram-portrait-landscape-photos/>. Ritzer, George. “Prosumer Capitalism.” The Sociological Quarterly 56.3 (18 May 2015): 413–445. Szyszka, Mike. “Thinking Outside the Square: A Guide to Instagram’s New Size Specifications + Templates.” Reaction. 2015. 10 September 2015. <http://reaction.ca/blog/marketing/51-instagram-guide>. “Thinking Outside the Square: Support for Landscape and Portrait Formats on Instagram.” Instagram Blog. 2015.